Summary: These results were very satisfactory and showcased ASY’s best-ever second-half. Notably, this supplier of air conditioners, heaters and water pumps said “robust operational management” rather than “extreme climatic conditions” had supported its positive progress. The accounts remain in good shape, too. With earnings now at their highest level since 2008, the share-price has re-rated to a P/E of 15. I continue to hold. September’s interim statement had already indicated these 2016 figures were likely to be ASY’s best for eight years, and I was very pleased that was actually the case. Without the benefit of “extreme climatic conditions” — demand for ASY’s equipment increases during prolonged periods of hot, cold and wet weather — the group cited “robust operational management” as the basis for the underlying financial improvement. All told, full-year revenue gained 9% and operating profit climbed 20%. Positive progress was reported within ASY’s main UK division as well as its various European and Middle Eastern operations. Overseas revenue represents more than a third of the group’s top line. ASY’s latest performance has been bettered only once, during 2008, when revenue was £67m and operating profit was almost £18m. I hope the momentum from the buoyant H2 will extend throughout 2017. For what it is worth, the board signed off its annual statement by stating it was “cautiously optimistic for further success” — a phrase previously repeated within the 2012, 2013, 2014 and 2015 results. These 2016 results did not reveal anything too worrying within the accounts. Year-end net cash was bolstered by post-Brexit currency fluctuations, which created a £2.6m windfall via the group’s overseas cash balances. The cash generation supported the declaration of the now usual 11.9p per share/£5m final dividend, which gave 23.8p per share for the third consecutive full year. 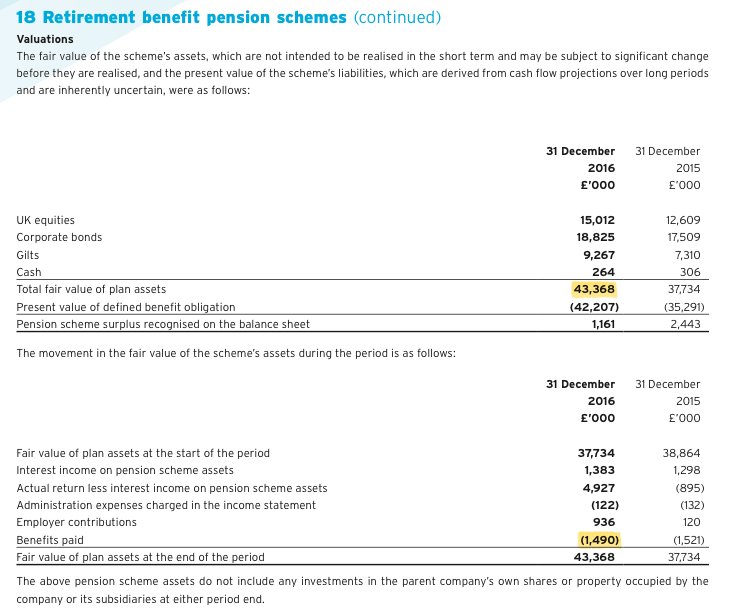 However, the cash-flow statement did reveal an extra £814k contribution to the group’s defined-benefit pension fund. 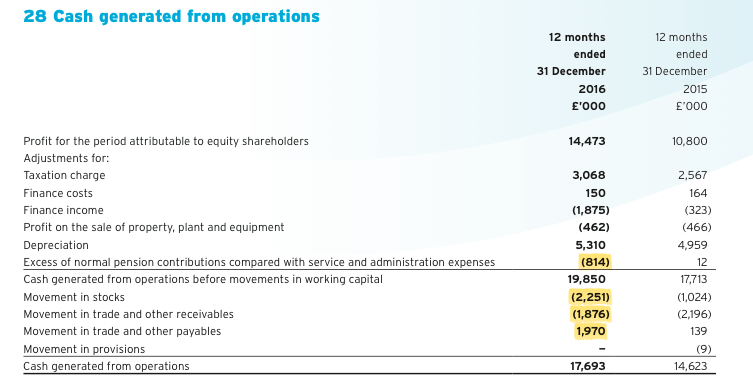 This type of contribution is not charged to the income statement and, in ASY’s case, represents a not insignificant 5% of the £16m headline operating profit. Indeed, these 2016 figures showed a pension-fund surplus of £1.2m. Sadly, it seems the additional pension contributions will continue for the time being. (See point 6 in the first Comment below). Elsewhere within the accounts, the group’s trade investment in Saudi Arabia continues to be carried at a £164k cost. This investment paid ASY aggregate dividends of £1m-plus during 2012, 2013, and 2014, and I suppose one day could be worth much more than £164k. That said, no dividends were paid by this investment during 2015 and 2016. 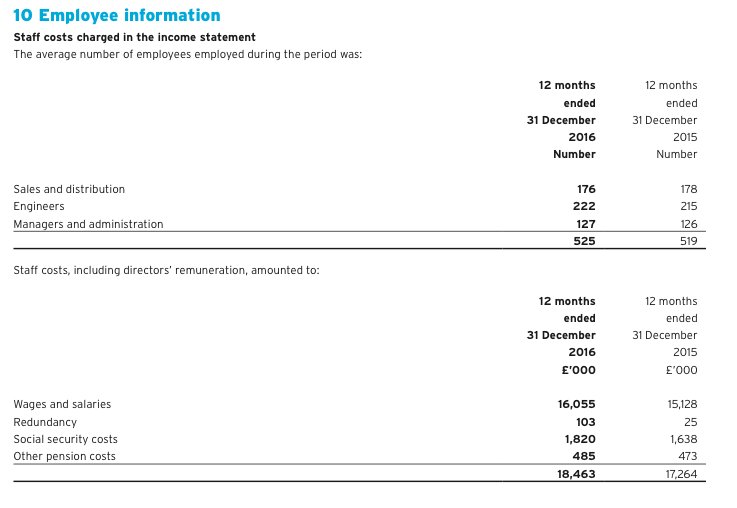 ASY’s £15.8m operating profit translates into earnings of £13.0m, or 30.7p per share, using the 18% tax charge applied in these results. Subtract the £18m net cash position from the £211m market cap and the enterprise value comes to about £193m or 458p per share. Then divide that 458p by my 30.7p per share earnings guess and I arrive at an underlying P/E of approximately 15. You may recall from last September that I had wondered whether the company and its share price were starting to ‘break out’ following years of earnings stagnation. Well, last September certainly was the time to re-evaluate the group’s prospects — back then the underlying P/E was 11 and the share price has since gained 40%-plus. Looking back, it was an opportunity to seriously consider buying more shares. That said, the prior eight years of stagnant revenue and earnings would have made anyone somewhat wary about false dawns. Finally, the trailing yield is 4.8% and my 30.7p per share earnings calculation covers the 23.8p per share dividend 1.3 times. 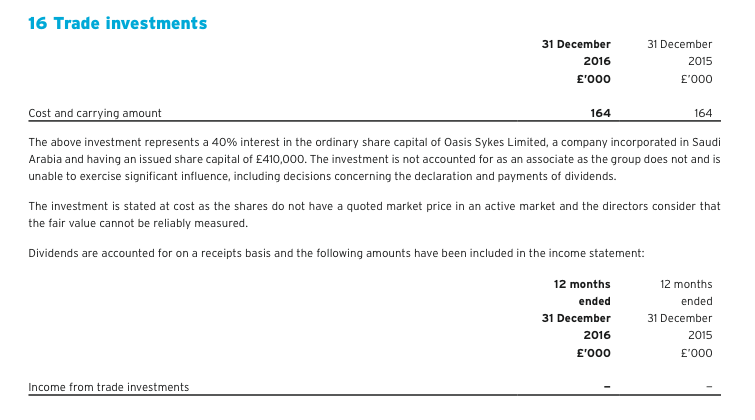 ASY’s annual reports do include a fair bit of management narrative that is not produced in the original results RNS. However, for 2016 the additional text did not contain any great revelations from what I could tell. But there were a few snippets of interest. The extra management narrative did outline a little bit more as to what happened during the year. I like the fact that just the Swiss operation is now the only overseas division losing money, with Luxembourg and France moving into profit. 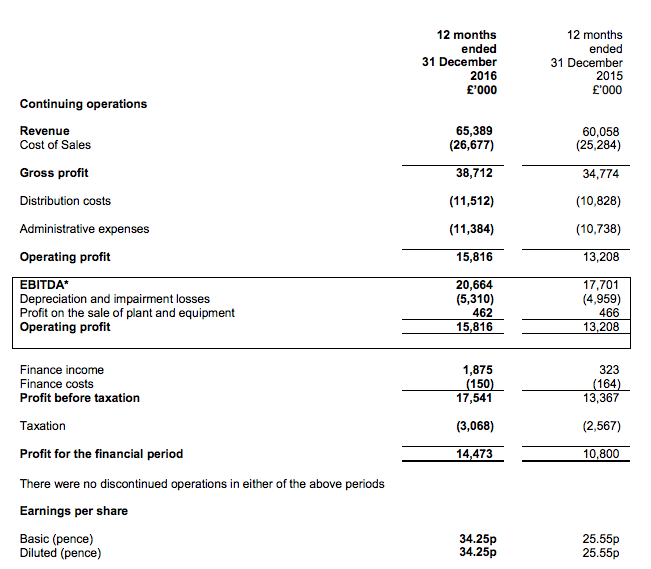 A profit of £13,779k from revenue of £49,708k gives a 27.7% margin before central costs. It required just 6 extra people to produce the £5m extra revenue for 2016. Cost per employee increased from £33k to £25k, and although the total employee cost as a proportion of revenue dropped from 28.7% to 28.2%, the percentage still remains somewhat higher than the 26.5% or less recorded between 2006 and 2013. The extra pay does not look too bad in light of the 2016 group performance. However, Mr Wood has been on a gently climbing fair whack for some years now, during which time ASY’s operating profit has mostly bobbed around between £12m and £13m. I do hope operating profit can advance from £16m during 2017 and beyond at a rate faster than Mr Wood’s own pay. At least the 90%-owner/chairman does not draw a fee, and there are no director options. I hope he can make it to 100. The scheme’s assets of £43,368k are required to pay annual member benefits of £1,490k, which is equivalent of a 3.4% required return. If you adjust for the contributions of £960k less scheme admin costs of £120k, the required return is (£1,490k – (£960k – £120k))/£43,368k) = 1.5%. Those figures do not seem too worrying in light of the sample I evaluated within this Comment. Nonetheless, the pension scheme is a niggle given c£1m of shareholder cash (c2.3p per share) is being diverted away from shareholders every year. The note above shows overdue trade debtors of £8,360k versus current unimpaired debtors of £8,204k — the first time the former has exceeded the latter since the figures were first disclosed in 2006. 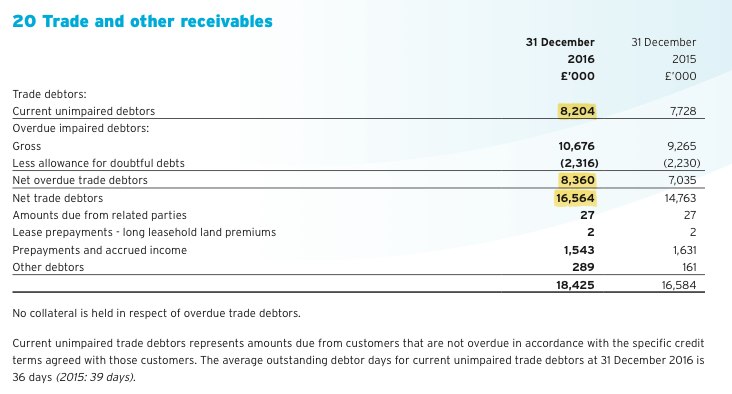 Furthermore, total trade debtors as a percentage of revenue, at 25.3% (£16,564k / £65,389k) for 2016, is higher than recent years (21%-24%), but has at least been witnessed before (25.9% in 2010). All told, while ASY’s trade debtors do not signal obvious problems, they are certainly worth monitoring. My visit to last year’s AGM revealed the directors suffer “difficult dialogue” with the majority owner of the investment and the likelihood of any imminent value being realised would be remote. I now ignore this investment within my valuation sums, but assume one day it could be worth more than the £164k book value. I have held these shares since 1997 and being a weather forecaster have been very interested on the effect of weather on their trade. For a long time I kept in contact with quite a few of the directors and managers giving them pointers on the weather and hearing from them how it affected their trade. The company took a long time to recover from Mr Hook’s disastrous takeover in the late nineties but they managed to recover after assimilating a failing business that was pretty well as big as they were. The company is now being run much more professionally. However. I have to say that the weather has not really helped them much for many years now. Some flooding and a few hot spells and cold snaps but nothing really mega. At some stage there is going to be a hot summer or a proper cold winter and when (if) that happens the company are in far better shape now to profit substantially from it. The first half of this year will be good due to further currency gains and also the hot spells in May and June (a long time since we have seen that). If the summer stays warm, and it all hinges on the next few weeks, the interim results should be very good with an optimistic statement at the end. I’ve held the shares since they were 55p and can thank this company for many holidays and new cars over the years! They still look good to me, mainly because I believe the weather will help them sooner or later. Many thanks for the informative comment. I read your comments on the ASY ADVFN board. I went to the AGM last year and the management said the company benefits from hot spells, cold snaps and wet weather in that order. Prolonged heat waves are what could really enhance profits, and 27 degrees is apparently when demand for air conditioners etc starts to increase notably. It is more to do with duration of any heatwave, rather than the peak temperature. The longer the heat wave goes on, the longer the rental. The shares are almost a ten-bagger for you now. Well done. With dividends as well, that is a very acceptable return, and all from a business that hires air-cons, heaters etc. Who would have thought that? My investment has not been as successful as yours, but it has more than doubled within 4 years (I think) and delivered some handsome dividends, too. Many people are put off the shares by the spread, the 90% ownership etc, but if you are prepared to hold longer term, the economics of the business and management’s careful stewardship ought to sustain further positive progress. Agreed, the recent weather should be helpful to ASY and we are probably overdue a prolonged cold winter, too.